What was possibly Adelaide's third theatre organ was to be found at the Wondergraph Theatre in Hindley Street. The theatre opened on 5 September, 1913 [Ross Thorne, Cinemas of Australia via USA, Architecture Dept., University of Syndey, 1981, p. 378], and was perhaps the most opulent theatre yet in Adelaide. It seated 1800, and was reported to have cost nearly £60,000 ["The New Wondergraph Theatre", The Advertiser, Adelaide, 5 September, 1913, p. 19.]. On the main floor there are tip seats for 1350 per-sons, four aisles and three large escape doors in addition to those in front. The screen on which the pictures will be shown is of plaster on brick, and its di-mensions are 32 ft. by 24 ft. there is an entrance to the front stalls from Peel Street, and the or-chestra rooms and con-veniences are reached by that entrance also. The orchestra department is two feet lower than the floor, and there is a special sounding board to throw the music back into the hall. Mr W Cade is the conductor of the orchestra." "Provision has been made for an orchestra of 60 players, as it is intended to arrange for special musical nights. Between the musicians and the sstage an arched sounding board has been constructed, and this, combined with the admirable acoustic features of the theatre should add much to the pleasure of the entertainment." There is no mention in these press reports of the organ, which was a small Fotoplayer (Style 35) of two ranks (Flute and String) only. An early photograph shows it, almost hidden behind a large cabinet of rolls, at the extreme left-hand side of the orchestra pit, partially covered by the overhanging proscenium. It is presumed that the instrument was installed from the opening of the theatre. In addition to its pair of pipe ranks, it contained three sets of harmonium-style free reeds, a glockenspiel, various effects and percussions and a duplex roll-player. In 1917, it was removed to the Glenelg Theatre, in the seaside suburb of Glenelg, and its subsequent history is described here. 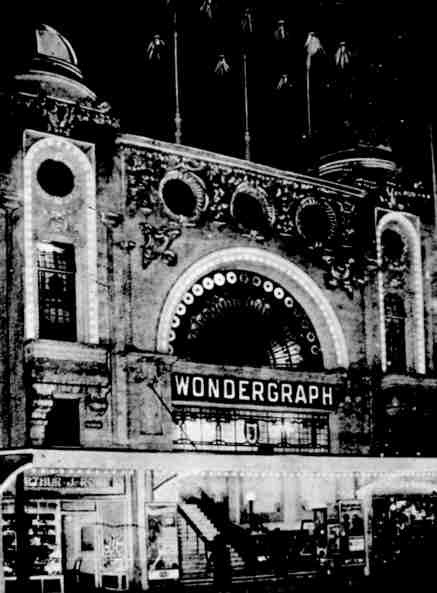 The Wondergraph theatre was taken over by Union Theatres in 1929, and was renamed the Civic in 1940, when some of its elaborate exterior décor was removed. In 1956, it was again remodelled, and was renamed the State Theatre (although it did not reflect the luxurious State theatres in Melbourne and Sydney). [Ross Thorne, Cinemas of Australia via USA, Architecture Dept., University of Sydney, 1981, p. 380]. It closed in approximately 1976.